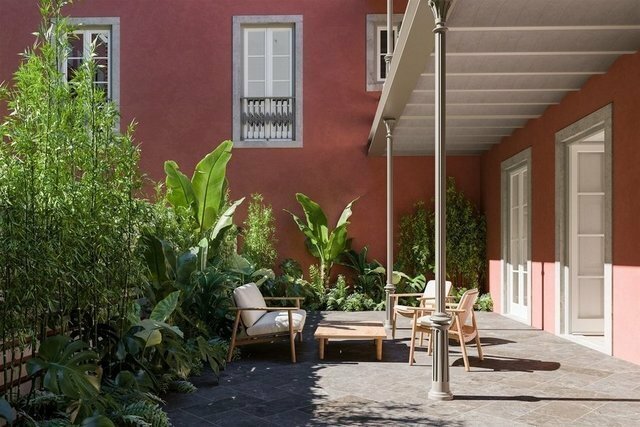 Preserving the palatial dimensions of this 18th century property and the beauty of its original facade, the Ficalho offers 11 distinct apartments, with typologies between T1 and T4 and housing areas ranging from 56 to 220 square meters. These personalized spaces display the historical charm of the old world of Ficalho, transported to modern residences that respect its original architecture and design. Completely renovated, paying special attention to the quality of materials, work and finishings, the walls of Ficalho house a charming private interior courtyard, providing exclusive spaces with large and intimate terraces and views over the city and Tagus River. The development also offers a concierge service. This three bedroom duplex apartment has high ceilings and a private terrace of 75 square meters.